Pakistani Governor May Have Been Killed Because He Opposed Blasphemy Law : The Two-Way The alleged killer told police he acted because the lawmaker had spoken out against the laws, Pakistan's interior minister says. It is Pakistan's highest-profile assassination since the 2007 killing of Benazir Bhutto. The body of Punjab Gov. 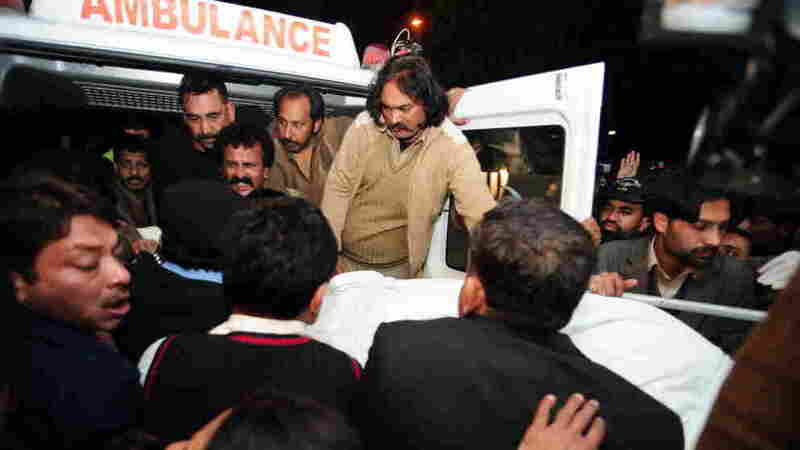 Salman Taseer is loaded into an ambulance in Islamabad earlier today. Already deep into yet another of its recurring political crises, Pakistan was rocked today by the "most high-profile assassination of a political figure [there] since the slaying of former Prime Minister Benazir Bhutto in December of 2007." The victim: Punjab Gov. Salman Taseer. He was, as the Associated Press writes, a high-profile member of Bhutto's Pakistan People's Party and a close associate of President Asif Ali Zardari, Bhutto's widower." He was reportedly gunned down in Islamabad by one of his own guards. From Islamabad, DAWN.com reports that "it was his stance against the [Islamic] blasphemy laws that apparently led to his killing. Interior Minister Rahman Malik told reporters that the suspect in the case had surrendered to police and told them he killed Taseer because 'the governor described the blasphemy laws as a black law'." The BBC adds that Malik said "the police guard who killed him says he did this because Mr Taseer recently defended the proposed amendments to the blasphemy law. This is what he told the police after surrendering himself." As NPR's Julie McCarthy reported on Morning Edition last month, Pakistan's blasphemy laws have led to a Christian woman being sentenced to death. And that has spared a "holy row in Pakistan," Julie reported.